Cat climbing furniture satisfies your kitty's inner need to climb and take the high ground. Many cats like to find a high place to survey their territory, and take naps (natch!). Some house cats will take every opportunity to climb, and many will use any structure or piece of furniture as their personal climbing challenge. Other cats are occasional climbers, periodically finding high spots, often especially during or just after playtime, or when they get the "5 O'clock crazies." As you may have noticed, there are many types of furniture for felines. Cat climbing furniture is specifically designed to give your cat that vertical satisfaction that she craves. It also allows good use of vertical space in small areas, such as apartments, small houses, or small rooms. The Kittywalk Cozy Cat Climber is a unique piece that can be mounted on a closet door. If your cat is climbing your furniture, and/or scratching it, you'll probably want to invest in one of the many cat furniture pieces on the market. Climbing furniture goes by various names, and comes in a wide variety of configurations. Most of these products are for indoor use, but some can be used outdoors. Indoor cat climbing furniture generally goes by various names, including cat trees, cat condos (or kitty condos), and cat gyms. Some of these have several levels, may have hiding spaces, scratching boards (usually made of sisal), and built-in toys. Some can be wall mounted. Construction is often of wood (possibly particle board), covered with some type of material (often carpeting), but other materials and construction are possible. There's not a strict definition of the differences between cat trees, cat condos, and cat gyms. All of these could probably fall under the umbrella classification of "cat tree furniture." But, Catsplay.com, a leading online seller of cat toys and discount cat furniture, divides their products into these categories. They also offer cat playgrounds as well, which are usually more elaborate and spread out climbing systems. Generally speaking, cat trees will have open perches and possibly built-in scratching posts; cat condos will usually have enclosed hiding and sleeping spaces; cat gyms will often have multiple perches for leaping to and from, as well as tunnels, enclosed resting areas, and built-in toys. 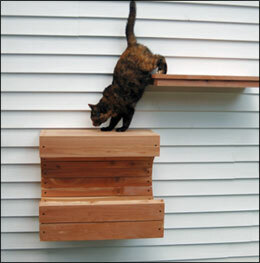 For outdoors, some outdoor cat enclosures come with climbing structures and perches, or can be adapted by mounting some. There are also some outdoor cat furniture options that aren't carpeted, and are made of weather resistant wood or other materials. Outdoor wall climbing systems mount to the outside wall of your house (or the inside of an outdoor cat enclosure or fence). They're often made of cedar wood and come with a cradle and one or more shelves, which are designed to be mounted on different levels. Some cats, especially long hairs, will prefer to perch lower, and aren't avid climbers. They may still want to be elevated, just not way up high. Or, they may prefer to spend time in a relatively hidden spot down on the floor, such as under a bed. This is sometimes referred to as the difference between "bush dwellers" and "tree dwellers." If your cat is a "low rider" (many of the Persian and related breeds fit this category), you may want to get one of the shorter cat condos, or maybe set up a cat perch by a low window. Unique cat furniture with life-like luxury cat trees handcrafted out of solid wood... hollow inside and perfect for climbing, playing, lounging, hiding and sleeping on. 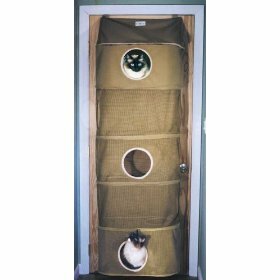 Catsplay has a nice selection of cat furniture, including these kitty gyms.